Lorenzo Music was an American actor, voice actor, writer, television producer and musician. Music’s best-known roles include voicing the animated cartoon cat Garfield, and Carlton the doorman on the CBS sitcom Rhoda. He is also known for his work as Tummi Gummi in Disney’s Adventures of the Gummi Bears, the original voice of Peter Venkman in DIC’s The Real Ghostbusters, and Larry the Crash Test Dummy in a series of United States Department of Transportation public service announcements that promoted the use of seat belts which ran from 1985 to 1998. In his early career Music was a regular writer and performer on Music became a writer and a regular performer on The Smothers Brothers Comedy Hour during 1968 and 1969. His work as a writer on The Mary Tyler Moore Show in 1970 would lead him to his big break. He was the co-creator of The Bob Newhart Show (with his then-producer/writing partner David Davis) which went on the air in 1972 and ran for six years; he also co-wrote the theme song to the show with his wife Henrietta. Music continued writing for the Mary Tyler Moore Show spin-off Rhoda. While casting Rhoda, the producers were looking for a voice actor to play the part of a character that would be heard but never seen: Carlton the doorman. When they heard Music’s sleepy, husky voice, they offered him that role, which made his voice recognizable to a worldwide television audience. Music co-produced and co-wrote a 1980 animated special Carlton Your Doorman which won an Emmy Award. In 1976, he and Henrietta were given the opportunity to host a syndicated television variety show of their own. The Lorenzo and Henrietta Music Show was produced at a time when there was a glut of television variety shows, and it did not last. In 1983, Music voiced the character Ralph the All-Purpose Animal in the stop-motion animated film Twice Upon A Time. In 1982, Jim Davis’s comic strip Garfield was the most popular strip in America. Compilation books of the strip were topping best seller lists, and Davis was negotiating to make an animated television special. Producers needed someone to voice the main character in the strip: Garfield, a lazy, oafish and demanding cat. After one audition, Music was cast as the voice of Garfield (in Davis’s words, “I looked at the room full of (voice) actors, and then in the corner I saw Lorenzo, quietly licking himself”). 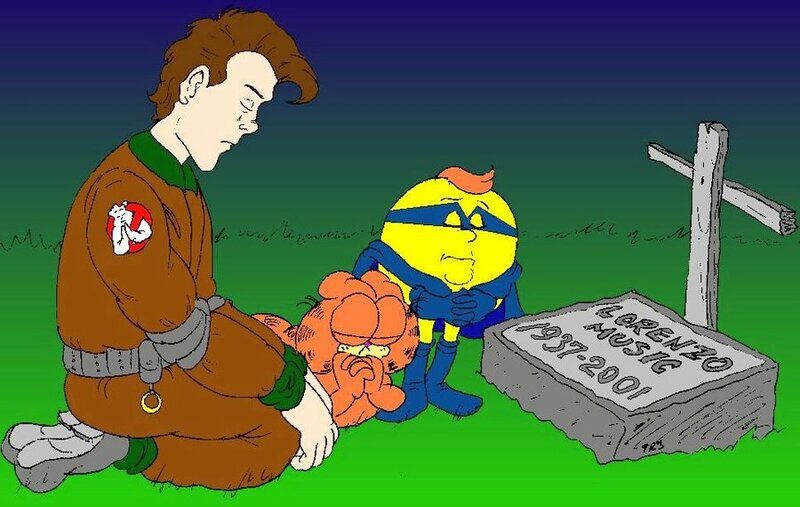 More than 12 Garfield television specials were produced and the Garfield and Friends animated television series ran for seven years. Music voiced characters for shows such as TaleSpin as Sgt. Dunder, The Real Ghostbusters, Disney’s Adventures of the Gummi Bears as Tummi, Pac-Man, Pound Puppies as Teensy in the season 2 episode Little Big Dog, and Darkwing Duck. In the mid-1990s, after Garfield and Friends, Darkwing Duck. When Disney’s Adventures of the Gummi Bears concluded, Music retired from cartoon voice acting. In 1996, Music’s voice could be heard on Stan Freberg’s Stan Freberg Presents the United States of America Volume Two album, released as a CD by Rhino Records. Music appears on the album as James Madison and Robert E. Lee. Music also appeared as an intercom announcer on an episode of The Drew Carey Show. In the early 1990s, he served as the voice-over for commercials for Ore Ida Potatoes and Fruit and Cream Strawberry Twinkies. He later served as the pitchman for Ruggles Ice Cream (a local brand from Orrville, Ohio). Music continued his role of Garfield for several PC games, such as Garfield’s Mad About Cats, through the late-1990s. Sadly Lorenzo Music died from complications related to lung and bone cancer on August 4, 2001. His ashes were scattered at sea. He is survived by his wife, Henrietta; his daughters Roz, a prominent Hollywood make-up artist and Leilani; his sons Fernando and Sam; and his nephews Ryan, Todd and Scott. A month before his death, Lorenzo returned to voice Garfield one last time for an automobile commercial. Since Music’s death, Frank Welker has often replaced him as the voice of Garfield the Cat in recent productions of the Garfield franchise. Bill Murray was chosen to voice Garfield in the live-action/animated films Garfield: The Movie and Garfield: A Tail of Two Kitties. Music voiced Murray’s character of Doctor Peter Venkman in The Real Ghostbusters. It a bizarre twist Music was actually replaced by Dave Coulier on The Real Ghostbusters when Bill Murray complained to the studio that the character sounded too much like Garfield.